Like people, references can be related. Maybe the work at hand was reviewed in another. Maybe it rebuts an argument made in a prior publication. Perhaps it’s simply tripe, as was sadly pointed out in a critique. Reference links allow you to enumerate and define these relationships. You can annotate links with your own comments, quotes from the works themselves, or any other information you find helpful. 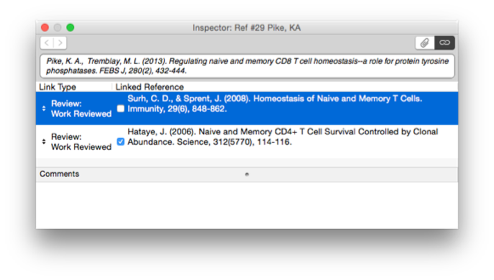 Open the Link Inspector, drag and drop references of interest, assign relationships, and you’re linked and loaded.